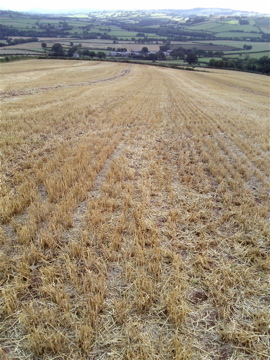 It is my first foray into the newly cut wheat field. Stalks under sun are briefly gold: Dog runs through filigree, entirely impervious to the grandeurs of colour. She rolls in some olfactory delight, which might be of equal mystery to my understanding, and runs and rolls and her tongue lolls and her tail whizzes. I have missed the musical plink of these stalks under the tread of Wellington boots: zigzag a path just to hear more of it.